← How to convert documents of OpenOffice to JPEG? 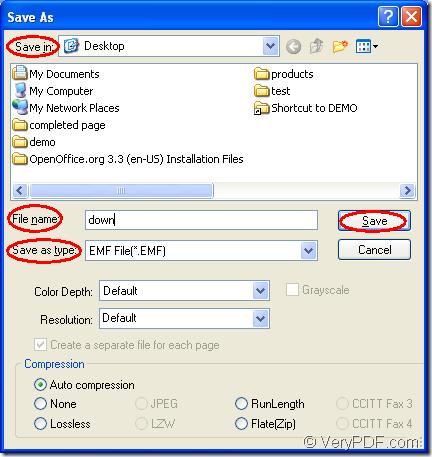 How to convert documents of OpenOffice to EMF? 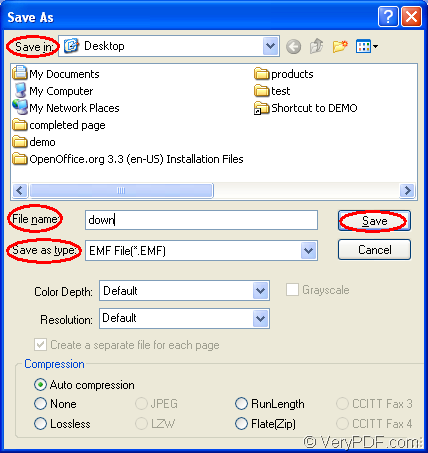 When you want to convert document of OpenOffice to emf, such as the document of ods to emf, you can choose the application docPrint Document Converter Professional as the tool for it is a powerful document converter which is able to convert many kinds of printable documents to 50+ image formats. The free download website of docPrint Document Converter Professional which is also called as docPrint Pro is http://www.verypdf.com/artprint/docprint_pro_setup.exe. The virtual printer docPrint is one application in docPrint Pro. It can act two roles—The Windows printer and the document converter. As a printer, docPrint can scale page to different size number, which can save paper and ink efficiently. As a document converter, it can convert any printable documents to many kinds of image formats such as OpenOffice to emf. It is also easy to use and you just need to print the document to docPrint for launching it. After installing docPrint Pro on your computer, if you cannot find docPrint in the installation directory, please don’t worry. You are able to see the application in the printer list by clicking “Start”—“Printers and Faxes”. Please see the conversion steps in the following contents. Please open the OpenOffice document in OpenOffice program. You should click “File”—“Print” to open “Print” dialog box and set the printer as “docPrint” in “Printer” combo box. Then please click on “Print” button. If you want to use some other way to open “Print” dialog box, please press “Ctrl”+ “P” on the keyboard at the same time. You can right click the document and choose the “Print” option when the docPrint is the default printer on your computer. You can see the “docPrint” window immediately and in the window, you need to click “File”—“Save as” or click the “Save File” button in the toolbar to open the “Save As” dialog box. The hot key “Ctrl”+ “S” is often taken by many people when they want to save files. In the “Save As” dialog box, you should save the target file through the following operations. In “Save in” combo box, you should find a location for the target file on your computer disk. In “File name” edit box, please input the name of the target file. In “Save as type” combo box, the output format can be chosen. Then you should click on “Save” button. A green progress bar will appear and it will disappear when the conversion from OpenOffice to emf is over. Please see “Save As” dialog box in Figure1. To read more articles about docPrint, you can visit the blog VeryPDF Knowledge Base. How to print rtf to pcx? How to convert MS Office Word documents of doc to jp2? How to use docPrint Pro v6.0 to convert a long HTML file to multi-page TIFF file? How to convert documents of OpenOffice to JPEG? This entry was posted in docPrint Pro and tagged OpenOffice to emf. Bookmark the permalink.